ALDINE – A concrete mixing plant that has existed for some time, on a site at 2219 Hartwick Road, has applied to the Texas Commission on Environmental Quality (TCEQ) for a renewal of their air permit license. The plant is known as Integrity Ready Mix, and/or CemTex. 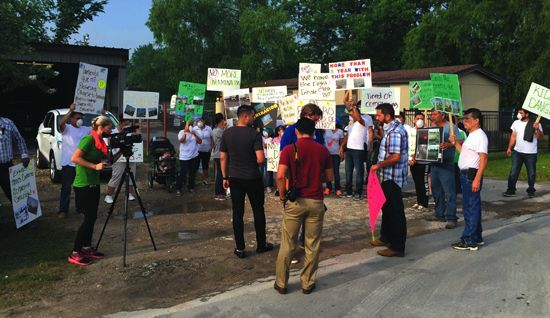 Neighbors in this area and on the street, are protesting the approval of the permit, citing three points, according to their spokesperson, Raudel Macias. The neighborhood has organized and had several meetings on this subject, and invited State Representative Armando Walle, and Adrian Shelly from the Houston Air Alliance. They have also contacted the East Aldine District, State Senator Sylvia Garcia, and Pct. 2 commissioner Jack Morman for help. Macias states that there are several problems that should be considered on whether the permit should be renewed. These include air pollution, as the neighbors say the plant and trucks emit silica dust, a known lung cancer cause. Also, the concrete trucks spill wet concrete on the roadway, and residents say they wash it away into the ditches, or just let it remain on the pavement. Finally, they object to the heavy truck traffic on a narrow, residential street.